Top-down shooter created to Movie Game Jam. 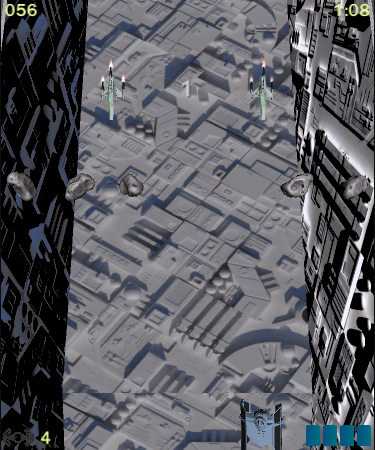 Based on starship battle on Death Star from Star Wars. Starship battle scene on Death Star from Star Wars: Episode IV - A New Hope. 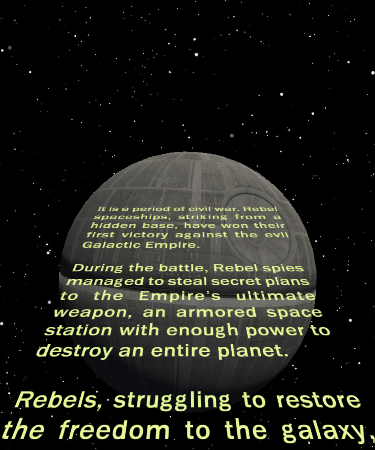 Top-down shooter based on starship battle on Death Star from Star Wars, but from empire viewpoint. Post your high score! the fonts, the cinematics really matched the movie. 5 out of 5 on that. Other than that, the audio was cool and it was a fun game. Can I use other peoples' work in my game? We do not take responsibility for any unauthorised uses of other peoples' work (e.g. music, sound, art) and any consequences that may result from its use. Please use work that you are authorised to use or that you created from scratch yourself. So, isn't forbidden, but the usage was discoraged. Thanks for making your game it was fun. There time that I had trouble for hear you, since the game audio is too loud. A keyboard sounds are a bit loud too. Besides this, nice video! You played pretty good for someone who doesn't used the special weapon. You discovered a bug: When you are invincible after respawning, you can defeat the boss just by colliding. - i find these games often feel a lot better when each regular enemy takes 1-2 hits to destroy and gets replaced by more, than enemies that take 5 or so hits each. Obviously this depends on the enemy type - it's fine if larger ones take more hits, but getting that power fantasy feeling right is all about the ease of dispatching regular foes. 1. I agree. This problem happened before and I can't believe that I let his pass on this game! I used "GetAxis" instead of "GetAxisRaw" so the player slide a little. This won't disturbs me, so I didn't notice when I was making the game. 2. I may be wrong, but believe that this was a alternative to the genre. Like Sonic's rings was a alternative from standard energy bar system. Anyway, your opinion was valid. 3. Besides the scenario what BurningOut mentioned (and I replied), and if you aren't too slow, I believe that there no pattern who you can't avoid. For those problems, use the special weapon. The main problem is that these pattern aren't easy to notice from the first play. Many thanks for the big feedback! I enter in jams for these kinds of reviews! I managed to reach the Millennium Falcon and then got completely destroyed, Rebel scum. Good fun game. I think some of the enemy shots are a little bit quick (Millennium Falcon) so without knowing which way they are going to shoot its very difficult to react quick enough. Also, the player ship is very large so I found myself in situations I could not get out of, mainly when the two Y-Wings start shooting and the path of their lasers cross. Other than that it captures the feeling of Star Wars well, good job. About the Millenium Falcon shots: This is a valid opinion, but I found out people who avoid these shots without big problems. 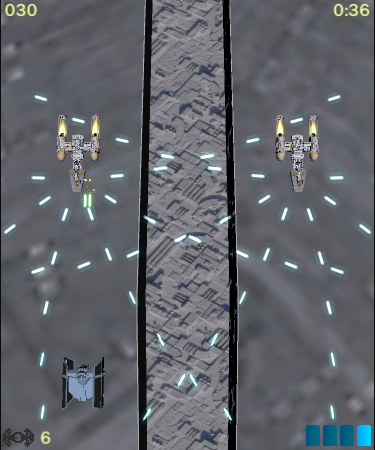 About the Y-Wing shoots: There two easy ways to avoid it: Use the special weapon OR stay in the middle. Very nice little game. The controls felt a bit "floaty" to me which made it difficult to maneuver between some of those tough spots. Might just be my laptop though, I'll try again tonight when I'm at my desktop. But, please, don't forget that some players don't use a qwerty keyboard : for me, it was terrible to use such keayboard configuration (imagine the situation transposed to qwerty: "z" for up, "q" for left, but still "d" for right and "s" for down). If you can, propose a custom configuration, or at least an arrows possibilty). By the way, your game is as beautiful as hard to play ^^ Well done ! But you can play using arrows! This possibility was listed on "controls" menu. Oh ! I've just tried, and yes, the arrows are working. I've tried yesterday and it wasn't. Probably some "Verr Num." of my laptop (I'm not used to laptop). Sorry for the mistake. With arrows, I've played 10 seconds more (your game is too hard for me ^^" But don't worry, I never win to mine either ^^) ! Still a great game. Cinematics, menu designs, scene changes all are very tasteful. Congrats.